Deserta’s wolf spider. Photo courtesy of Emanuele Biggi, http://www.anura.it/emanuele/. 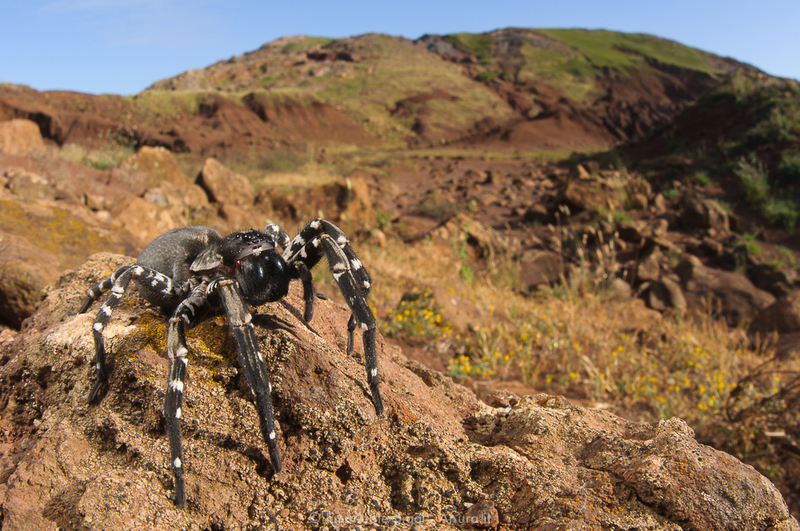 With arachnophobia being one of the commonest fears globally, it is exceedingly difficult to promote conservation efforts for endangered spiders. “Good riddance!” might be a typical response to news that a spider species is in danger of extinction. One of the largest species of wolf spider in the world, with a body length of up to 40 mm and a leg span of 120 mm, the Desertas Wolf Spider is also one of the most endangered. It is restricted to a single valley on the island of Desertas that forms part of the Madeira archipelago in the Atlantic Ocean. This valley, the Vale de Castanheira, has become invaded by a non-indigenous grass Phalaris aquatica that completely outcompetes the native flora. Where this invasive species occurs, the spider does not. As a result, the distribution of this native top predator has diminished by almost three-quarters, with approximately 4,000 adults remaining. Efforts to secure the future of this large spider have focussed on eradicating Phalaris aquatica through herbicides and fire and thereby recovering the native flora. While this invasive plant has been shown to have a profound negative effect on the spider, an invasive millipede Ommatoiulus moreleti has become an important component of the spider’s diet, reinforcing the complexity of the invasive species issue. Since this wolf spider shows some degree of opportunism in terms of diet – it has also been known to prey on juvenile lizards – there is hope that it could adapt to restoration of its’ habitat. Conservationists have also recommended establishing an ex situ breeding programme to secure the future of the species, since restriction to a single valley renders it susceptible to catastrophic events. While the appearance of the eight long striped legs and hairy abdomen of this spider might send shivers down the spine of many people, the disappearance of this species entirely from Desertas would be all the more ‘bone-chilling’ as it would mean yet another failure by humans to protect a unique component of an island’s fauna.